17-10160K Retrofit Cover Plate for hand dryer recess box. 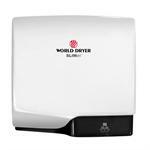 World Dryer - OEM Retrofit Part - WDP-17-10160K Cover plate and bracket. This kit will allow you to cover the box from a recessed World Dryer Model A or Model M Airmax that you want to convert to a surface mount dryer. Includes a bracket and cover plate (pre-set up for a World Dryer SLIMdri). 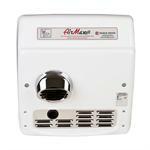 Compatibility Covers recess box from any World Dryer Model A or Model M Recessed hand dryer. Comments Includes securing bracket and face plate. 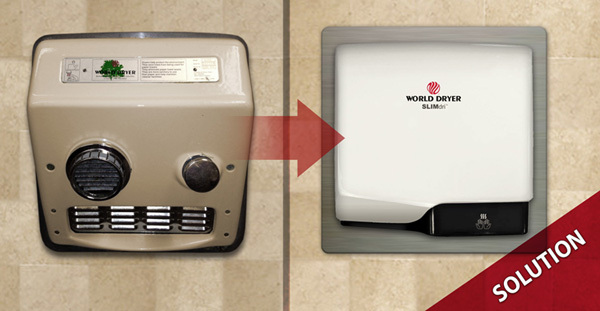 Provided mounting holes are designed to fit World Dryer SLIMdri (L Series) hand dryers. 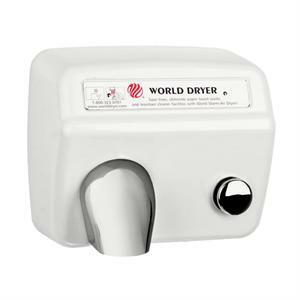 World Dryer AirMax hand dryer, model XRM5-Q974, Recessed hand dryer with cast iron cover, white, 115 volts, Automatic.